Quite a few years ago I stood on the eye of the Uffington White Horse on an overcast day with daughter Alice. We heard Concorde a way off, doing her best not to go supersonic before she cleared Cornwall. That sound was unmistakable. The powerful rumble got louder, the clouds parted and that dagger of a shiny dart glinted in the sun as she slid through the sky she was in, showed herself for a second or two, then was gone returning to her world, a diminishing smooth roar high above the clouds in the clear blue. A few minutes later, I told Alice, she’d be across Exmoor and over Steve and Jackie’s farm. 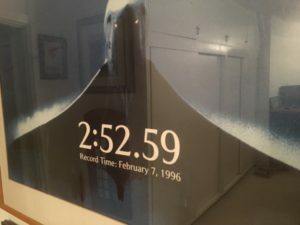 Jackie would hear her and check her watch, high above the they’d light the blue touch-paper and, with a deep distant boom-boom, Concorde would be gone, faster than a bullet, her passengers sipping bubbly and watching the mach numbers climb. The passing of Concorde was a tragedy in more ways than one but 9/11 didn't help and the Internet would have done for her in the end. There probably won’t ever be anything so iconic and so close to the heart of millions that was so recongniseable. Tim Orchard is well known within ballooning. He is also well-known for saying, “Golf Bravo Uniform India Echo, Good morning, Speedbird One here,” or whoever was floating about, on the ballooning frequency as he flew overhead. We were honoured to design and build a Duo Chair out of a pair of Concorde seats for him. My son and I made the maiden flight in them with large smiles on our faces. 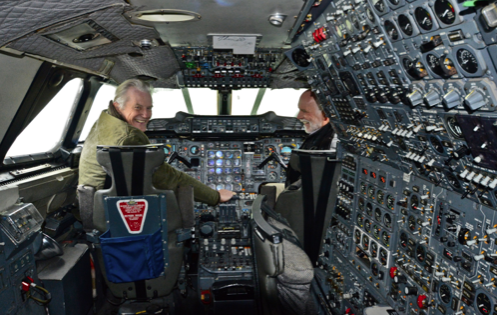 Sadly that was the closest I ever got to going for a flight in Concorde. Tim, on the other hand, may never have flown in a passenger seat until we built them into a balloon. He sat in the driver’s seat. Tim’s career flying big aeroplanes started on the Trident, then onto the British Airways Executive jet used for moving the Chairman and Chief Executive (Lord King and Lord Marshall) around Europe and, when they weren’t on it, for other communications and logistics duties in association with the airline. Tim explained that when it was sold under ‘cost-cutting measures’ he “had” to go and train as a Concorde co-pilot. Silver lining? I should say so. In the interim he became a Captain on the Boeing 777 before taking command of Concorde and flying the ‘rocket’ back and forth across the Atlantic. Eventually the dream came to an end and, as Concorde became relegated to history and museums various, he went back to the 777. Not quite the same thing. He did though leave his mark on the history of supersonic flight involving scheduled airliners by instigating, and achieving, the fastest crossing from New York to Heathrow by passenger jet. The story has been told a few times now and a degree of urban myth hath crept in. Here though, in honour of our first Timbo Day, held on the 7 February 2019, is the real story of the event. Next Timbo Day will be 9 April, the maiden flight of G-BSST, the first UK built Concorde from Filton. Please enjoy. Over to you Tim. I had had thoughts of a record attempt for some long while. I had seen four or five sets of seasons pass and had heard those with vast experience on the aeroplane pontificate that they had broken the three hour East-bound barrier with ease. I had sneaked a look at some BA-held data which belied that this time was “often” beaten. Indeed, one or two chaps had had their bluff called over a New York beer or two. I gleaned sufficient information to know that you had to have quite a number of ducks in line before you could break three hours. Further, you would have to be very canny to come in five minutes or more off that 3 hour slot. It was also clear that February was the month for such, both from a “low-level” wind velocity and from the upper air temperature points of view. Meteorology hadn’t been the easiest of ground-school subjects for young Orchard’s ATPL exams in 1973 but suddenly the word “jetstream” began to seem important. Also, it was necessary that various ducks on the ground also needed to be aligned to ensure that any attempt might not be immediately scuppered by unknowing or unwitting action by others. I put in place a number of thought processes to help things to happen smoothly should I be in a position to suggest a record attempt and for us not to suffer any annoying delays en-route. It was starkly obvious to me that any February day which demonstrated that the Westbound Concorde flight was to take a deal longer than the usual 3 hours and 20 minutes would mean that the conditions in the atmosphere were ripe for a fast Eastbound crossing soon after. Our Westbound flight-plan on 6th February 1996 showed much longer than usual. I happily found, too, that the Eastbound flight we were passing that day had a planned time of 3hrs and 8 minutes. That meant that if we attempted it, we would have to work very hard, but it might be possible! I had sufficient friends and colleagues within the various Air Traffic Control units which could be called upon to offer unofficial help on “the day”. It was my plan to align these favours by telephone now that I knew there was a record chance. I was merely the co-pilot, of course, and not able to simply decide that we should do this. 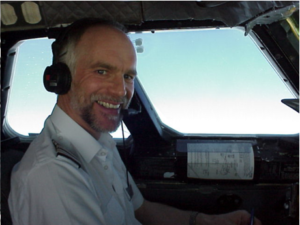 The Senior Flight Engineer, the late Rick Eades, was extremely competent and known to be “game” for most off-the-wall ideas. Captain Les Scott was, in February 1996, comparatively new to the aeroplane. It was a measure of his expertise and experience that he allowed me to persuade him to even discuss making a record attempt, particularly as it was a normal passenger revenue service. During the trip outbound, we pooled knowledge and resources as to some of the decisions which needed to be dealt with both pre-flight and during the trip. All three of us immediately knew, and stated, that safety would not be compromised in any way. We also agreed that we would not tell the passengers or our cabin crew until it was all over. Better not to have failed them, if we didn’t break the record! There would be many reasons to cancel the attempt and return to absolutely normal operational routine, such was the regularity of minor unserviceabilities on the aeroplane as well as a myriad of external and unpredictable factors. On the ground in New York I spent some time organising those required 'ducks' into the correct row, ATC-wise, to help us leave New York and arrive at Heathrow expeditiously. I can still picture the telephone bill with some horror. So, next morning we were prepared for a normal trip, with up to 100 unsuspecting passengers and with five unaware cabin crew, for a more-than-usually adrenaline-charged trip for us three flight crew. The departure from Kennedy was accompanied initially by a very relaxed ATC clearance. However, they did ask us to maintain only 5000 feet immediately after take-off. That could ruin the whole game. Much persuasion later, we were cleared on a more than usually direct route to the beginning of Concorde’s “Oceanic Track” at 50 degrees West. At least the phone calls to JKF ATC Supervisor and to Tracom’s Air Traffic Centre seemed to have worked. With our weather radar looking at the coast-line and our DME picking-up Nantucket, we felt sure we had given the minimum 20nm space from the local populace. Surely, if those living on Nantucket Island complained of a sonic-boom this afternoon there must be a US Navy aircraft carrier with boom-laying aeroplanes around on whom it might be blamed? Our trans-Atlantic crossing was on the normal supersonic route (“Sierra-November”) and we used standard operating procedures. When we came within range of the Oceanic Controllers who are based in Ireland (Shanwick), we were treated to a slightly more direct routing across Irish airspace and the South-West approaches. Les Scott was bold enough to allow us to stay high and fast as long as possible. By this, I don’t mean a dreaded “rushed approach”, but merely that the deceleration from Mach 2 and the arrival at subsonic speeds and altitudes were made somewhat more suitable to a record attempt than to a normal revenue service. In any case the good old Air France Concorde always made a sonic boom in South West UK at that time of night. We had a perfect alibi if it was required! We wanted to maximise the energy and elected to employ two engines in reverse thrust in the air to descend and reduce speed to make the Easterly landing at Heathrow. Having flown the HS Trident airliner in a previous life, I was pleased to find that the second airliner in my BA career also allowed the pilots to use reverse thrust whilst airborne. Messrs. Boeing and Airbus have never done this; I guess they value their wing-mounted engines and wings rather highly. It was somewhat agonising, therefore, having planned to reduce energy with the use of reverse thrust, to find that only one engine would play ball. We tried and tried, but one steadfastly refused. Only months later was it pointed out that there was a (secret-to-pilots) 'speed-switch' which had prevented the reverser working. Such was our desire to maintain high speed, we had unknowingly tested the accuracy of the safety-related speed switch….. it had been a little earnest in its operation. The good news was that our record attempt landing at Heathrow was due to be on the same tarmac strip as was in use by all other landing aeroplanes at Heathrow that evening. The less good news was that they were landing towards the West, whilst we had to land towards the East to break the record. Our friends in Heathrow Air Traffic Control again came into play, allowing us to land in the opposite direction to the general flow of traffic. It was clear by the continued questions from Heathrow Approach and from Heathrow Tower that they would have preferred us to fit-in with the other aeroplanes, landing Westerly, unless we were guaranteed to break the record. We affirmed, on each occasion, that we expected victory. What the drivers of Mr Iberia’s Boeing 727 thought when they saw a Concorde approaching them head-on, we will never know. After landing, we first told our cabin crew and then made an announcement to the passengers that they had all been party to the new World Record. Our exact take-off and landing times had been recorded by the Air Traffic Control Towers at each end of the journey. These times were verified by the on board Flight Data Recorder trace (which was analysed for us at Farnborough). The FAI (sporting body) in France ratified both the attempt and the new record. A record that still stands, of course. It is sad that the 2 hours 52 minutes 59 seconds record time will never be beaten by other Concorde aeroplane or Concorde crew. 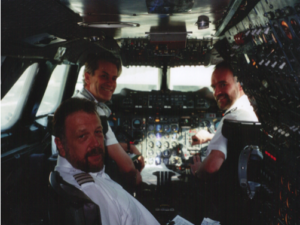 I am sure that the three of us flight crew would give-up our tiny notoriety in exchange for having that aeroplane back in the air….. which is where she really belongs. When the day came for the last flight of the British Airways Concorde’s Tim took G-BOAD, the aircraft in which he set the record back in 1996, on its last flight and delivered it to New York on 10 November 2003, where it eventually ended up in the Intrepid Museum. She had made her maiden flight on 25 August 1976 and, for a short while sported Singapore Airlines livery on one side. By the time she arrived in New York she had flown an impressive 23,397 hours. I remember him being quite emotional about the fact they’d left a perfectly airworthy aeroplane that had performed faultlessly, on the apron in New York, and that it would never fly again. First picture is Tim’s official record time proudly hanging in the main gallery of his country retreat. Second picture is him aged two, at zero knots, driving a Price Bread delivery van. 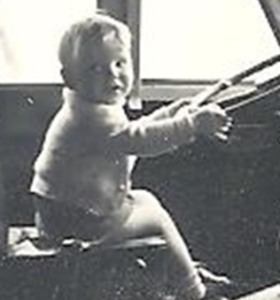 Third picture is Tim driving the rocket at Mach 2 and, rather worryingly, not looking where he is going! Piccie number four is of the beaming crew on the ground at Heathrow having broken the record. Les Scott is in the left hand seat, Tim in the right and, in the foreground, engineer Rick Eades who did all the hard work. The fifth picture of Tim and Les Scott back in the driving seats of G-BOAD in New York in 2018. 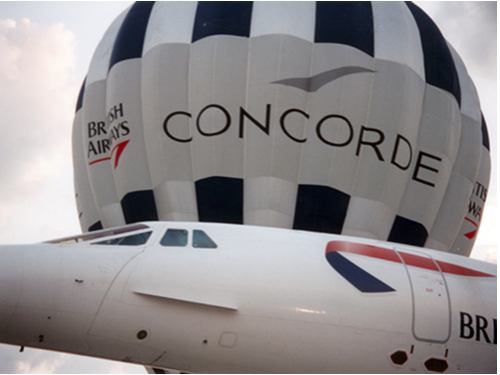 Lastly, but not leastly, is a rare picture of the only meeting of the Concorde Balloon and a real Concorde which Tim managed to bag at the OshKosh Air Display in America.